Can love survive racial, religious, and class conflicts? Max Henry and Zahra Ruffin in Mad Cool. BOTTOM LINE: She's black, he's Jewish, and they're both from Massachusetts, so when they shack up together in Brooklyn, all hell breaks loose. In Mad Cool, a so-relevant-it-hurts dramedy, a young couple gets way, way more than they bargained for when they move into a new apartment. 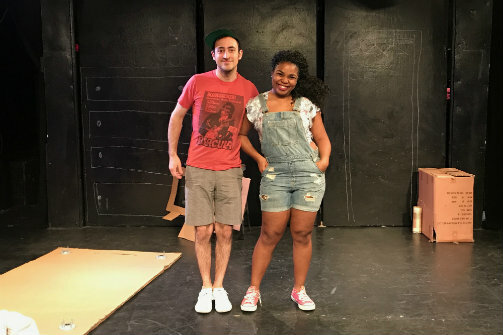 Daniel (Max Henry) and Tina (Zahra Ruffin) are stressed about cohabiting for the first time and exhausted from moving all their boxes and furniture. They’re also on edge because their new neighborhood, Brooklyn's Crown Heights, is on the front lines of New York City’s gentrification battle, which is how they can afford to move there in the first place. And Tina and Daniel are an interracial couple—she’s African American, he’s white and Jewish. As they unpack their baggage (literally), they are forced to unpack their baggage (figuratively). In the script by Nick Parker and Ayo Edebiri, this promising setup doesn’t live up to its potential, primarily because the relationship between Daniel and Tina strains credulity: to put it bluntly, she’s insufferable. Perhaps watching her continually be “triggered” by Daniel’s not-especially-offensive observations on race and class is supposed to be amusing, but after ten minutes it’s hard to see why they’re together at all. As directed by Diane Chen, the play also suffers from an inconsistency of tone; it veers from dark comedy to drama to borderline farce. Ironically, its most successful scene comes well into its second half with the entrance of two neighborhood cops (Gerrard James and Donnell E. Smith) who arrive at the apartment in response to an air conditioner mishap gone terribly wrong. Set designer Madeline Wall injects some avant-garde elements into the piece by having all of Tina and Daniel’s belongings either made out of cardboard or, even trippier, drawn onto the walls of the playing space with chalk by the characters themselves. If only the rest of Mad Cool were as daring or original as that. The issues it addresses—race, class, and community—are more pressing than ever; this play opens up a Pandora’s box but doesn’t deal honestly with what’s inside. Mad Cool is by Nick Parker and Ayo Edebiri. Directed by Diane Chen. Produced by Charles Hayes IV. Set and Costume Design is by Madeline Wall. Stage Manager is Sarah Brown. The cast is Max Henry, Gerrard James, Zahra Ruffin, and Donnell E. Smith.